I haven't hacked my install at all, and EE Keeper seems to find my saved games! This is a nice payoff for the Beamdog team keeping the save formats binary-identical across platforms. Importing EE Keeper into Wineskin was very simple. 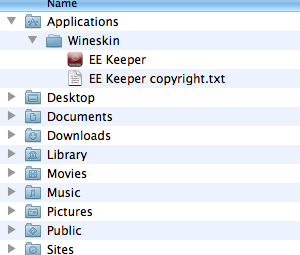 I might be able to just zip up my "EE Keeper.app" if the EE Keeper license permits re-distribution... if not, just do the default WIneskin directory import and you ought to get a working app. ... and that seems to work so far. ... tested loading an edited game, and it worked fine. After following your instructions, I can get EE to run and load/edit an existing save game, but the edited save does not show up in game. Any thoughts on what I did wrong? When I saved the edit, it did show up in the game, as "Trogdor (Edited 0001)". You did save the edit, right? @Nifft, that's awesome news. If it makes it easier, I can take out the part that looks for the exe (or put in a part that accepts the Mac executable). I'm unsure how to work the Documents directory to make it easier, but I'm sure there's an easy way once I get back to looking at it. And, yes, you are allowed to redistribute the program itself (provided that no alterations to the binaries are made, etc.). I'll just copy and paste the relevant bit from what Aaron wrote regarding it, you can view the full copyright snippet from the attached file. 3) Redistributions in binary form must reproduce the above copyright notice on program startup. Additional credits for program modification are acceptable but original copyright and credits must be visible at startup. If you can include the copyright file along with the download that would be great . When I make a new thread, I'll also link to this thread for Mac compatibility. Edit: some additions are needed for the new kits, so you can try out the new version when I get it uploaded at the same time. I'll be using an XP version of the compiler (for compatibility), so you'll have to let me know if there are any issues with Wineskin. I'll have that in a couple days. @Troodon80: Excellent, if I'm able to get it to work on a fresh account, I'll put up a .ZIP with my Wineskin'd Keeper and the Copyright. Thank you! Oh now that's interesting. On my system, that folder is NOT an alias, it's just a plain old folder! Why is mine like that? Probably because mine was created by the Windows BGEE (running under Wineskin) before I had the OS/X version of the game. Maybe I did other things to my set-up to get it to work... I'll try from a new user account. So, I tried this on a brand-new account, with no special setup, and EE Keeper worked fine. This works for me under 10.6, there are reports that it works on 10.8, and it might or might not work on other computers or OS/X versions. Done. The application "BB Keeper.app" is placed in /Users/yourname/Applications/Wineskin/ so just open up a Finder window and double-click on it. The attached picture shows where it will be installed. 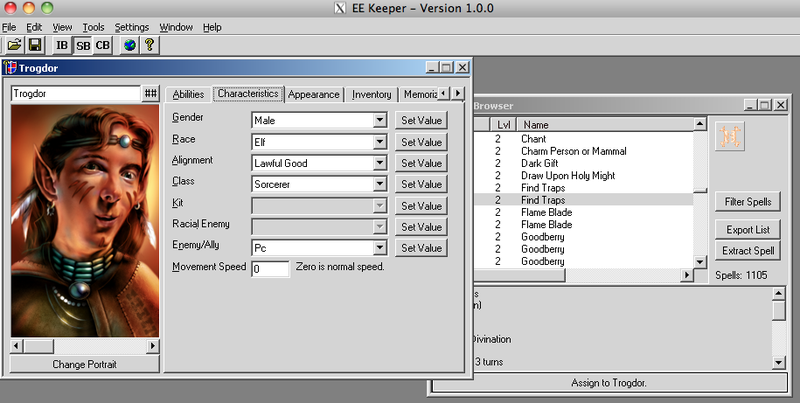 EDIT: Version number, now that there's a new release of EE Keeper. EDIT2: changed link to a hosting site with fewer obnoxious ads. Apparently this executable works, but the hosting site has some deceptive ads which prompt people to install an executable... and that smells like spyware to me. Try the dropbox link first, please! @spidermcfly: The symlink 'save' directory thing seems to be just how your version of OS/X (Lion?) works. I don't have access to any higher OS/X versions, so I can't test there. My tests with EE Keeper 1.0.1 have SUCCEEDED! EDIT: So it turns out you need to select a language after you set the installation path. I'd totally neglected to do that, so EE Keeper didn't work ... until I did select a language, and now it works. Mostly. Cutting & pasting Affects doesn't work, but it didn't work in the previous version either -- probably something to do with differences in how Macs handle the clipboard. @Nifft, your tgz package of EE Keeper in Wineskin works great for me. Running 10.8.2 on an older MacBook Pro. I was able to edit a save file and "clean up" some of the NPCs' stats. (ahem.) Thanks for the contribution! Just for clarification, I placed symlinks to the save folder, dialog.tlk, baldur.ini, and (just for kicks) the BG:EE executable in the main BG:EE application package, under Contents->Resources. I then directed EE Keeper to BG:EE->Contents->Resources at app startup. After restarting the program it worked great. It worked just fine for me in my own Wineskin wrapper without making any symlinks or other adjustments whatsoever. Thanks. That worked absolutely BEAUTIFULLY! Your instructions were so easy to follow Nifft. The only thing I struggled with was the initial download as I was confused by having to download iLivid first. Now Edwin is Chaotic Neutral, and shouldn't leave even if my rep soars! It's the same change I made when playing the original version all those years ago. I never really get why he's Lawful Evil anyway, Chaotic Evil would seem more apt. I think the "iLivid" thing is just a Sendspace ad... I can host the file elsewhere if Sendspace is too obnoxious. I didn't have to do that in Chrome... I just downloaded the file itself. I use FireFox, and I didn't have to do that either. I'm worried that you installed some kind of spyware... ugh, Macs shouldn't have to deal with that kind of thing. Sorry! I'll see if I can use Mediafire or someplace cleaner. GDrive works really well for sharing files as well. I already use Dropbox for other things so I settled on that. Works great using wine on OSX10.8. At first EEkeeper could not find to game even if pointed at the resources directory. Copying the dialog.tlk from the lang directory (which ever language you want) into the resources directory fixed this. I'd suggest symlinking rather than copying, so if you use mods the changes are reflected in both locations. cd "/Applications/Baldur's Gate - Enhanced Edition/Game Data/00777/Baldur's Gate - Enhanced Edition.app/Contents/Resources"
Obviously people who want a language other than "en_US" should change that part, but everything else should be the same. I used shadowkeeper and now when I enter East-Baldur's Gate there is a completely different music playing on the background and an ear-tearing ambient noise. Tried few times and always happens. /E Now happens also with saves untouched by shadowkeeper. I bought yesterday the game from Mac App Store, and downloaded EE Keeper (installed as Nifft wrote). EE Keeper found the game (manually browsed the resources directory), language set to en_US. EE Keeper ran without error, but when i tried to open a savegame (created 2 different-no autosave, or quicksave), couldn't find my savegames (blank window). I searched the forum, and read the comments, but it is not clear, what can be the problem. Could you please help me, what do I wrong? @Tsabuss - which version of OS/X are you using? Hmm. I've only got access to 10.6 right now, and I'm using the version from the Beamdog store... I think this isn't something I can test. Maybe someone from the BGEE team can tell us if there are any notable path differences between the Beamdog direct version and the MAS version. @Cerevant? I can check when the Overhaul folks wake up, but my understanding is that there is no difference - they just developed a launcher to deliver the app via Beamdog. Is it possible that EEKeeper put the modified game in either the Documents or the Resources folder? ... but IIRC the MAS version uses a different documents location? It's encapsulated in a "Library" directory somewhere? As I saw, the game installed into the Applications (as normal), and the save directory is in a different place somewhere in Library......\Documents\.....\save. I tried to create symlink (with a program - SymbolicLinker) to save directory and placed the link into Resources (I'm not sure, if this method good or not), but nothing. Should I do something special after I installed EE Keeper (somehow tell the program, where are my savegames, or something like that)? I'm not expert in creation symlinks. Am I missed something? ls -ld "~/Documents/Baldur's Gate - Enhanced Edition"
ls -ld "~/Documents/Baldur's Gate - Enhanced Edition/save"
Tell me what each of those prints out. Thanks! Ah. This is all OSX sandboxing fun. I need to talk to the devs about it, but I think this is an intentional OS limitation to keep stuff in the sandbox. The game will not follow a symlink out of the sandbox. You might be able to link the other way and have Shadowkeeper follow it.